Our OpenRouteService has some new features and crucial bug fixes to boast. First of all we revamped the backend of the service, and while not only making it faster, more stable and efficient, we added a new profile for heavy vehicles. This includes the sub-profiles forestry, agricultural and delivery vehicles as well as buses and trucks. You may have noticed, we now also provide an option to specify load characteristics of a heavy vehicle (e.g., hazardous materials) and also means to attribute its weight and dimension limitations (e.g., length, width, height, weight). All these parameters are very important in calculating a route, as a bridge or a tunnel with restrictions can be an impassable obstacle on the path to your destination. Regarding our Geocoding Service, we now offer requests for all over the globe and also the option to find administrative polygons. Our Accessibility Analysis now also works with RecursiveGrid and TIN and returns impressive isochrone maps (with holes) which can be visualized directly on the map. Furthermore, we introduced additional parameters that allow specifying intervals (in minutes) which are shown in different colors. 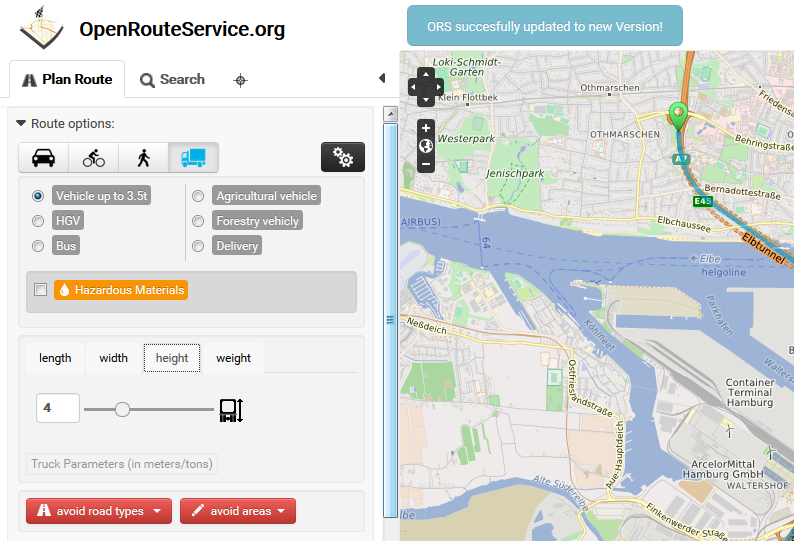 The client got a significant redesign and new functionalities such as a novel route instructions list for many languages (see Options page) and the support of multiple GPX files. Additionally, the set of avoid features have also been extended. It offers means to ignore ferries, unpaved roads and also steps. Furthermore, we have included a version control showing our latest updates and information regarding the graph status. Sharing a route with your family or friends became much simpler. Links, containing the settings of a route, are being nicely shortened using bitly.com service. We have a lot of ideas and future plans. Very good job! I switched to Graphhoppers due to the user friendly interface. But the routing was never as good as yours. Now I’m back with openrouteservice! congratulations! I switched to Graphhoppers due to the user friendly interface. But the routing was never as good as yours. nice application solution.